Many titles, including Netflix original series and films, are available in high-definition with Dolby Digital Plus 5.1 surround sound and some in Ultra HD 4K. Advanced recommendation technologies with up to five user profiles help members discover entertainment they’ll love. According to figures released by the company, Netflix had 69.17 million subscribers in October 2015. The latest announcement makes the service available in another 130 countries and territories(see here ) and Greece is included in the list of this global network. As a result, Greek subscribers can benefit from a month-free trial for series and movies and a monthly subscription starting at 7.99 euros. The Greek Internet on fire since the announcement was published with almost all news sites, blogs, etc. but also Facebook and Twitter accounts commenting around these interesting news. For good or for bad there are many fans of American series available from Netflix, which however used to get to watch these by means “illegal” streaming/downloading or with significant delays via Greek subscription TV (cable/satellite) and internet services. The advent of Netflix means practically the official passage of our country to on demand entertainment, something that has long been attempted by many local media and obviously will affect subscribers of OTE TV, Forthnet Nova or HOL (services that invest equally in US series and movies). 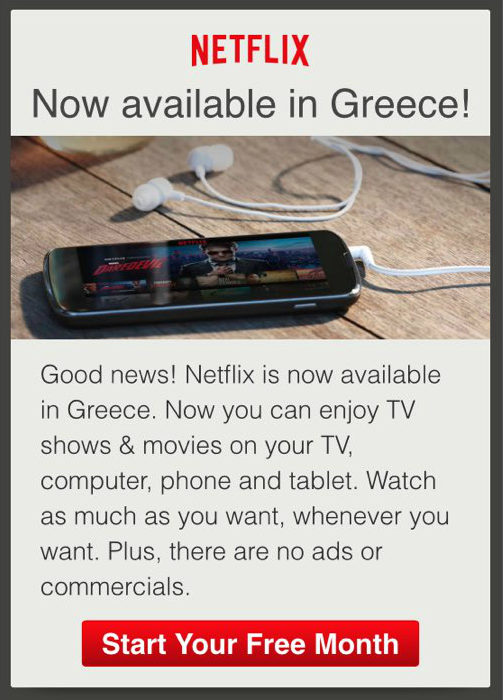 To start Netflix as available for Greece at https://www.netflix.com/gr/ provides three different packages with rates of 7.99, 9.99 or 11.99 euros / month, and with free trial connection one month. Unfortunately, the current list of available movies and series is not going to impress you significantly, while the non availability of Greek subtitles will certainly discourage many potential subscribers. Undoubtedly, the “globalization” of Netflix will influence in the near future the way which television series and movie rights are transferred and distributed, while in Greece it will significantly increase competition and of course affect relevant services pricing.